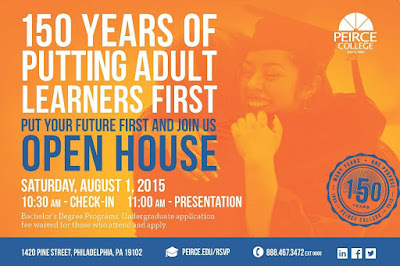 If you’ve ever wondered if now is the right time to return to school or thought you were too busy to pursue an education, you’ll want to attend the Peirce open house on Saturday August 1 at 10:30AM. 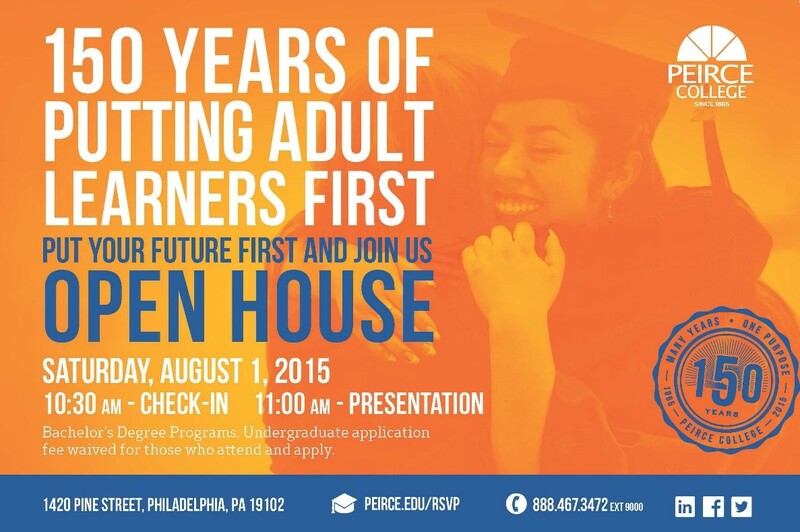 Attend the open house to learn more about the undergraduate degree programs Peirce offers that help working adults advance in some of the most in-demand careers in the Philadelphia region. At Peirce, we understand the challenges that working adults face and are committed to helping you maintain a healthy work-life balance while pursuing your education in a way that’s most convenient for you. In fact, it’s been a commitment we’ve maintained for over 150 years. Here’s your chance to see that commitment in action as you learn about our on-campus, online, and even flexible options that let you choose from week to week how you’ll attend class. In addition, you’ll learn about the many programs and support services we offer for working adults. The Peirce College open house is a personalized experience where you’ll get actionable insights about what your journey at Peirce will look like. You’ll have the opportunity to get to know the faculty of the area of study you wish to pursue in one-on-one breakout sessions, speak to admissions about your financial aid and scholarship options, and receive an on-the-spot evaluation of your transcripts. You’ll also have the chance to meet and network with Peirce alumni. If you’re serious about achieving your goals and advancing your careers, there’s no better time to get started. Come, learn, take action, and if you’re ready we’ll even waive the $50 application fee for those who apply at the open house. We hope to see you there! You can do it. Peirce can help.